Hi friends! I spent this weekend sick as a dog, banished to the back room with nothing but the TV and my good old kitty, Minnow, who is acting as my nursemaid. 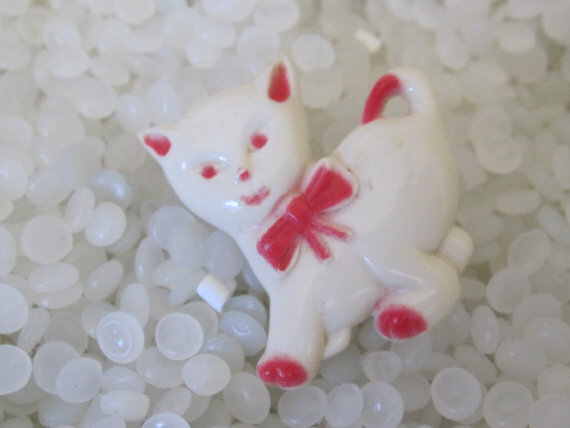 So, in her honor, I dedicate this week’s round up of vintage cuteness to all things kitty! Enjoy, my friends! Meow! 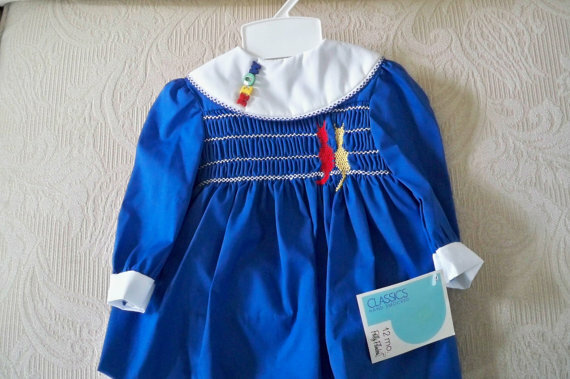 From Etsy seller, This and That Cape Cod. 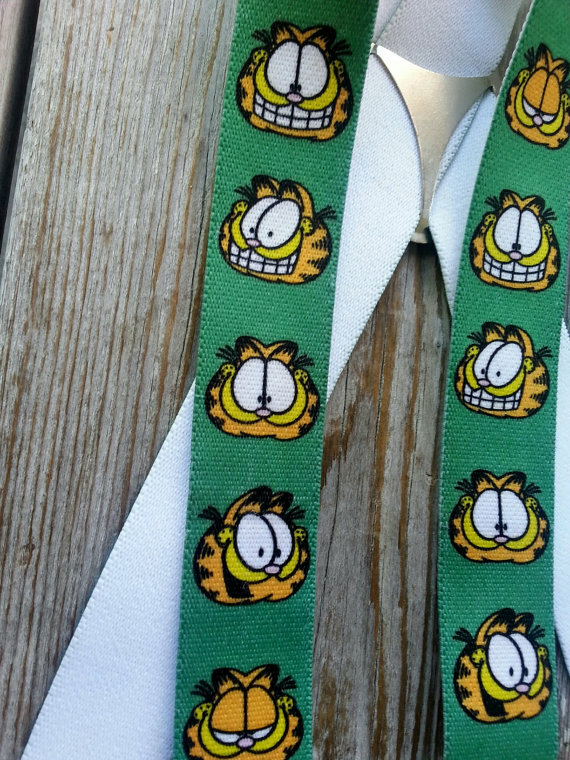 Who doesn’t need a pair of Garfield suspenders? From Etsy seller Robyn’s Nest. I love this little sweet vintage barrette. Darling kitty witty! From Etsy seller, Rosebud Cottage. 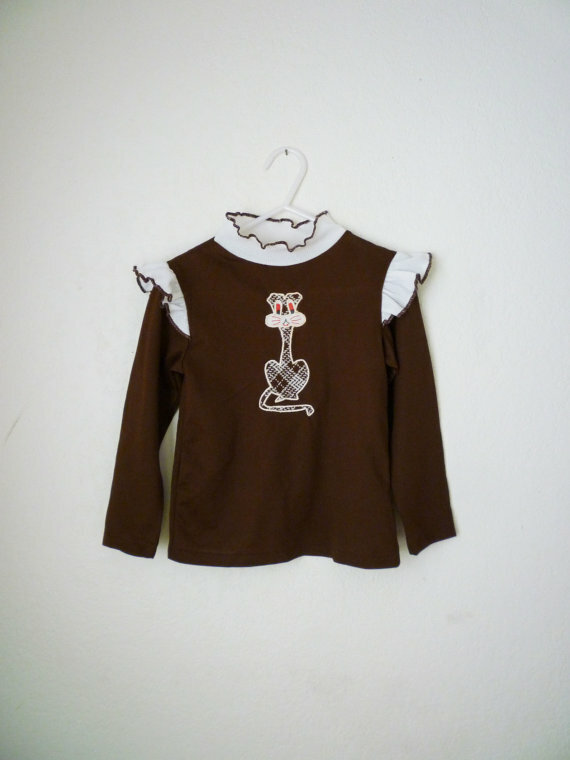 Check out this sweet tom cat shirt with the fluffy ruffly bits. So darling. From Etsy seller, Oh Sydney. 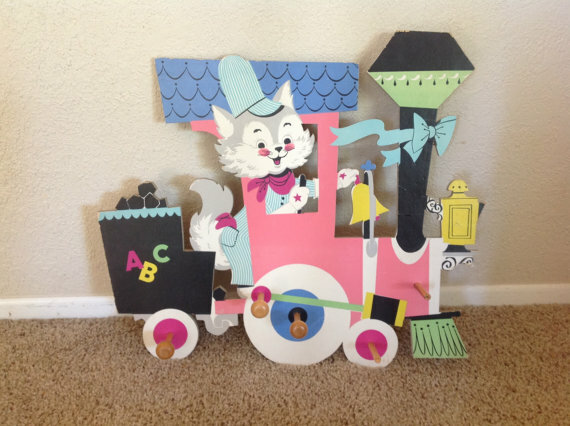 Who wouldn’t want to choo choo choose this great kitty train conductor wall hanging? From Etsy seller, Lulu Marigold. 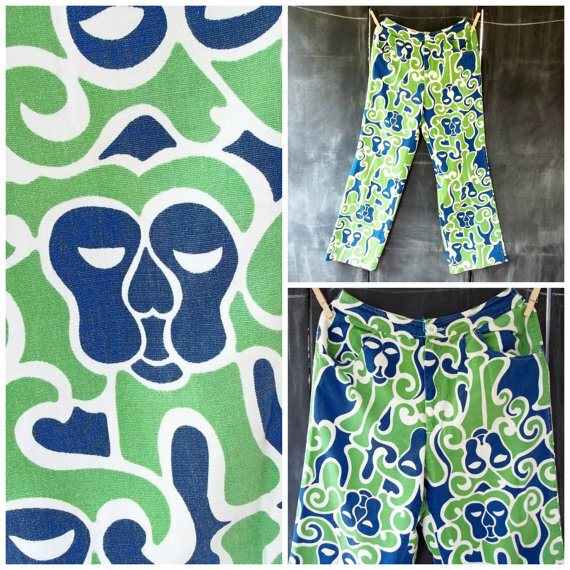 Lions are kitties too and they are all over these amazing pants! From Etsy seller, Vintarthromodern Kiddos. 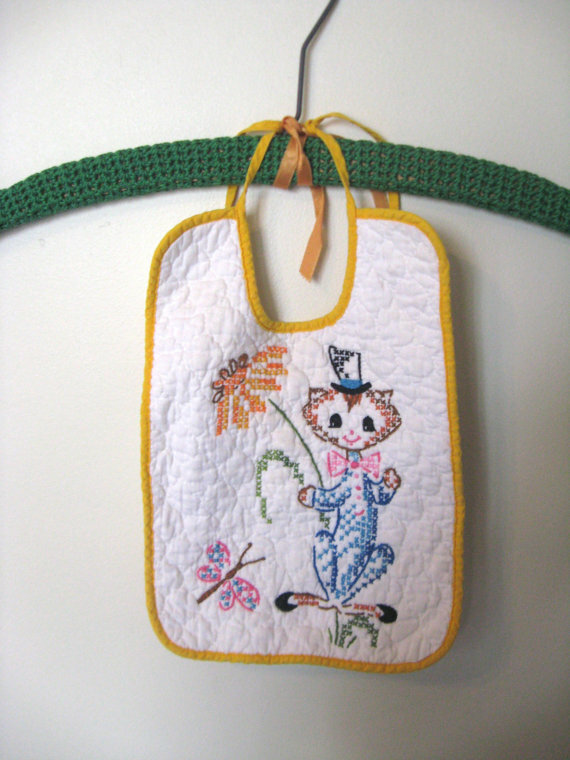 Who doesn’t love a kitty on a bib wearing a snappy little bow? From Etsy seller, Lovesick Vintage. 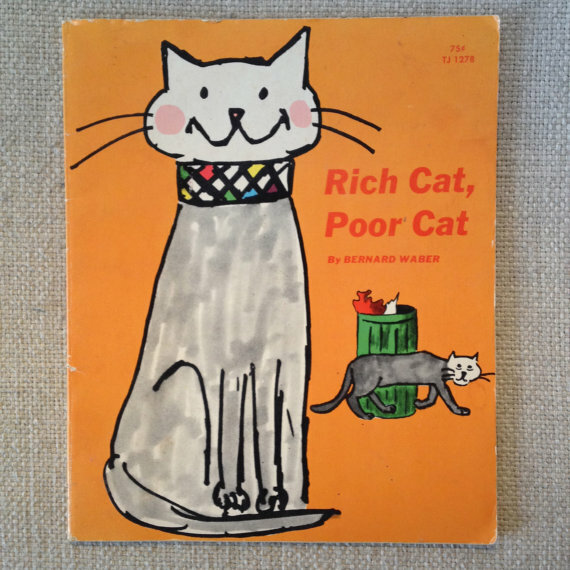 Here is one my favorite kitty books when I was a child, but it is a heartbreaker! Written by Bruce Waber of Lyle the Crocodile fame. From Etsy seller, Kishke Lovely. And then there is the Queen of all kitties, Hello Kitty! 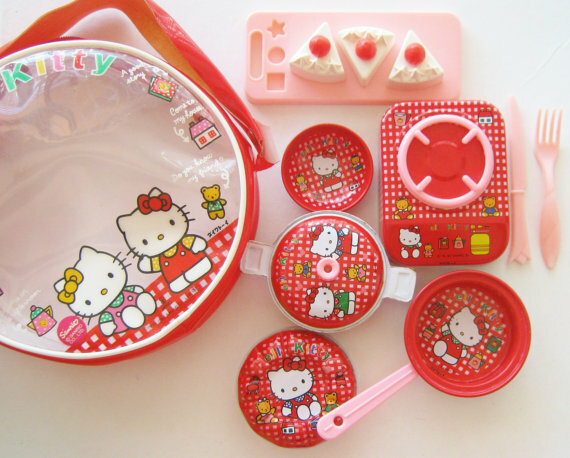 Check out this sweet vintage Hello Kitty tin plates, cake and stove set. From Etsy seller, Moon Parade. Who doesn’t love a good Steiff stuffed toy? Well, I do and I particularly love this little startled cutie cat! From Etsy seller, Steiff Phyndz. Love Rich Cat, Poor Cat!! Hope you feel better!!! Great Round Up! 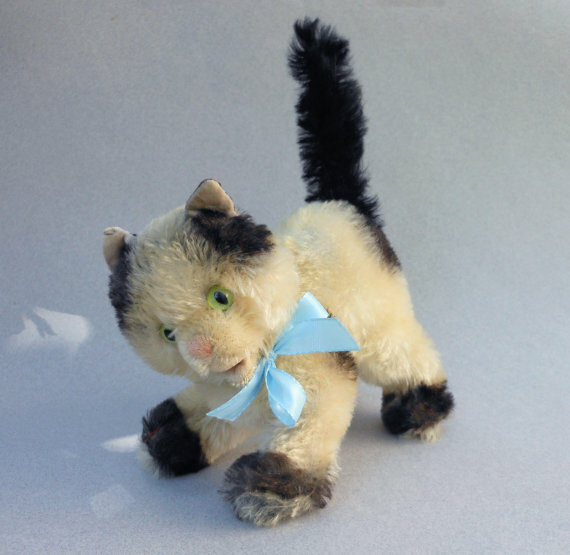 I just can’t resist vintage kitties! Thank you so much for including Rich Cat, Poor Cat and linking to my Etsy shop. I’m so happy to have discovered your site!! !